With the summer of 2017 coming to an end, it is time again to “Get into the Swim” with PMS. So whether you have had a great Tri season, open water swims, have otherwise got some swims over the summer, or just looking forward to getting back in the pool, we are looking forwarding to offering you a great program as part of your healthy life style. We start our season on Monday September 18, 2017 at the Pan Am pool with an open swim. All that is required is for you to bring a signed waiver. To save time, get the waiver, go to https://pickeringmastersplashers.com/membership/ or we will have copies at the pool. If you had a TPASC pass from last year, it should still work. Otherwise just let them know you are from PMS and they will let you in. For directions to TPASC, please check our website. All are welcome, whether you are a returning member or just want to try it out. This is to be followed by our official season opening informational session and swim at the Pickering Recreational Complex pool on Tuesday September 19, 2017 at 8:15 pm. Signs will posted at the main entrance to the complex with directions to the meeting room. This to be followed by a swim from 9:00 – 10:00 pm in the complex pool. With regard to pools and scheduling. Unfortunately DIP (Dunbarton High School Indoor Pool) will not be available until Saturday September 23, 2017 due to maintenance and repairs. So while this is being done, we are being allocated room at the complex pool for our swims on Tuesday September 19th and 21st. Should DIP not be available on Saturday September 23rd, you will be notified and we will continue our Tuesday and Thursday’s with no Saturday swims until DIP does become available. On the coaching front, we are happy to welcome back Rene St.Aubin, Kevin Boehnke, Iain Johnston, and Samantha Catania. All did a great job last season and we will be looking for the same this season. It should be noted that once you signed up, you will receive a confirmation email. Please click on the personalized link to confirm your membership. Welcome to February. Here are some of things happening in February at PMS. February meters Challenge. As posted on Facebook (access from https://pickeringmastersplashers.com/ home page). Let’s start logging your meters. Both on your own and during a PMS practice. The member with the most will be awarded a prize. You can either send your meters to Paul at gemmink@pickeringmastersplashers.com or why not post them to the Master Swim Canada Web site. Please see instruction below to get started with MSC. Once you are to member’s home page, simply select Million Meter Challenge and add your meters. As can be seen these can broken down or enter total in the mixed column. Note: for our purposes, please enter your meters from workouts and swims in February even though only meters enter after you signup date will count towards MSC awards. In case you need more of a challenge….this Thursday Feb 9th, Iain, will have a 1000m timed swim during practice. This is an option for those that would like to know how fast they can swim 1000m. We will repeat this in a few months to chart progress. You can also chart progress against an age graded performance chart (more to follow on this). In case you can’t make Thursday’s swim, Rene will also set aside some lanes on Saturday morning (Feb 11th), as will Kevin on Monday night (Feb 13th).You can also enter your time on the MSC under the 1 KM Swim Challenge. Saturday Mornings at Kathryn’s Bar & Grill for breakfast after the workout. MSC is sponsoring a number of swim challenges for members of which you are one. 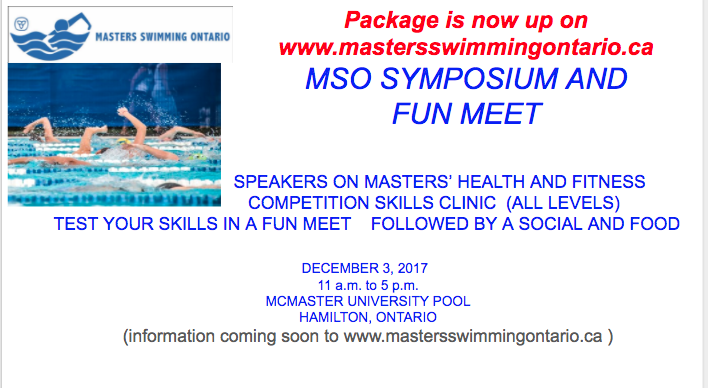 In addition you can see your profile including your master number as per your registration with MSO (Master Swim Ontario) which is part of you membership with PMS. You should now see your Member Page with the 4 current challenges, your swim meet history and Profile. As always, any feedback is always appreciated. Any questions / concerns, please let us know. The City of Pickering has announced that the Danbarton Indoor Pool (DIP) will be available as of Monday December 5, 2016. 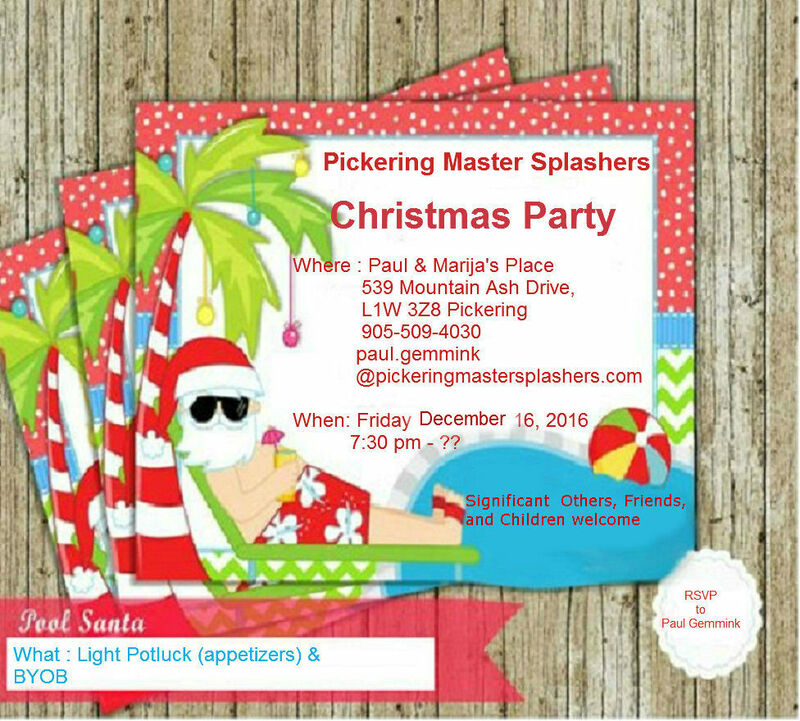 Therefore first PMS session there will be Tuesday December 6, 2016 and no longer be swimming at the Pickering Rec Complex. Any changes to this will be communicated as soon as it becomes available. PMS otherwise continues to Swim at TPASC Monday nights for the remainder of the 2016/17 season. Complete payment of all fees due by December 31, 2016.